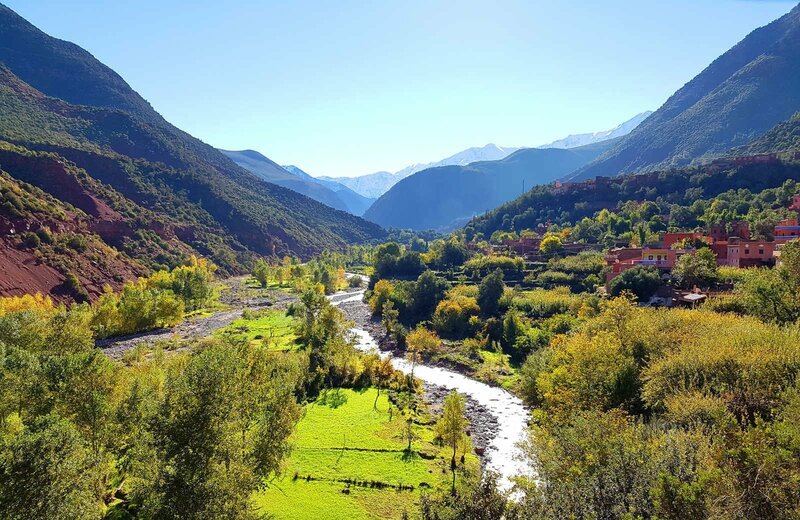 This amazing trip of 3 Valleys tour via Atlas mountains at 09:00 am from Marrakech to the Atlas Mountains, heading the first Ourika valley, famous by its waterfalls (if you want to visit this waterfalls you have to walk for about 1h:20 min for going and coming back with a mountain guide). You will enjoy different landscapes and get spectacular views as far as the eye can see. You will continue through the second valley that is Oukaimeden valley, and taking a secluded mountain road route standing at 1800 meters above sea level, you will cross the traditional Berber villages built from adobe and stones, and if you want to discover the authentic life of Berber people we can arrange a delicious lunch for you in a typical Berber house. After that, you will reach the third Asni valley, famous by its fruit trees (Apples, walnut, almonds, peaches…), this is where you can enjoy the sight of the snowy summits of the High Atlas Mountains, then you will cross Tahanaout village ( Berber market on Tuesday ). The thrilling tour concludes with a drive back to Marrakech, arriving at approximately 5:00 pm. See traditional Berber villages with an english speaking driver / guide. Admire the many waterfalls in Ourika Valley and see native women extract Argan oil. Get away from the hustle-bustle of Marrakech to the stunning. Atlas Mountains and witness traditional Moroccan life. Pass acres of almond, peach and walnut trees in Asni Valley. See traditional Berber villages in Oukaimeden Valley and take the opportunity to dine with a local family. The meeting point will be at the reception of your Hotel or from the nearest parking of your Riad in Marrakesh center.